Hoda El Shakry is Assistant Professor of Comparative Literature at Pennsylvania State University. After completing her Ph.D. in Comparative Literature at UCLA, she was a Faculty Fellow at the Gallatin School of Individualized Study at New York University. Her research interests lie in contemporary literature, criticism, and visual culture from North Africa, with an emphasis on the relationship between aesthetics and ethics. Hoda El Shakry’s work has been published or is forthcoming in GLQ ; Journal of Arabic Literature ; Contemporary French and Francophone Studies ; ALIF : A Journal of Comparative Poetics ; Expressions Maghrébines ; and Interventions : International Journal of Postcolonial Studies ; as well as in the Routledge volume : Arabic Literature in the Classroom : Teaching Methods, Theories, Themes, and Texts. Her first book, The Literary Qurʾan : Narrative Ethics in the Maghreb is forthcoming from Fordham University Press (2019) and was awarded the 2018 Helen Tartar Book Subvention Award of the American Comparative Literature Association. Her second book is a comparative study of twentieth-century Maghrebi cultural journals. Hoda El Shakry serves on the MLA’s Forum on Arabic Literature and Culture and is Delegate Assembly representative for the Global Arab and Arab American Forum. She is also a member of the Editorial Advisory Board of the Journal of Modern Literature. If, to paraphrase a famous literary adage, the novel reflects a world abandoned by God, what would a Qurʾanic model of narratology look like ? Moreover, how does the Qurʾan enact and invite critical reading practices ? While contemporary literary criticism has largely married the (post)modernist novel to an anti-theological ontology, interrogating the relationship between the Qurʾan and narrative calls attention to the differential valuation of literary and critical reading practice. The Literary Qurʾan mobilizes the Qurʾan’s formal, narrative, and rhetorical qualities, alongside its attendant embodied practices and hermeneutical strategies, to theorize Maghrebi literature. Challenging the canonization of secular modes of reading that occlude religious epistemes, practices, and intertexts, it attends to literature as a site in which the process of entextualization obscures ethical imperatives. To that end, the book engages the classical Arab-Islamic tradition of adab—a concept demarcating the genre of belles lettres, as well as the moral dimensions of personal and social conduct. Reading Islam through its intersecting ethical and epistemological dimensions, it argues that the critical pursuit of knowledge is inseparable from the spiritual cultivation of the self. Foregrounding questions of form and praxis, The Literary Qurʾan stages a series of pairings that invite paratactic readings across texts, languages, and literary canons. Reflecting both critical methodology and argument, it places twentieth-century novels by canonical Francophone writers (Abdelwahab Meddeb, Assia Djebar, Driss Chraïbi) into conversation with lesser-known Arabophone ones (Maḥmūd al-Masʿadī, al-Ṭāhir Waṭṭār, Muḥammad Barrāda). Blending literary and theological methodologies, conceptual vocabularies, and reading practices, the study builds upon an interdisciplinary body of scholarship across literary theory, Islamic and Qurʾanic studies, Philosophy, Anthropology, and History. 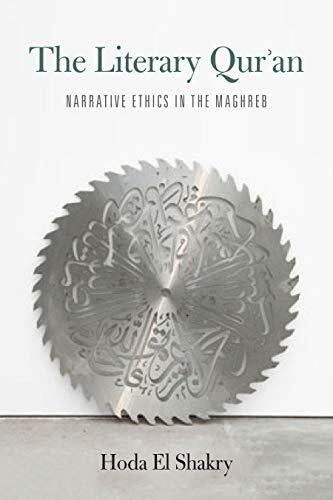 The Literary Qurʾan : Narrative Ethics in the Maghreb mobilizes the formal qualities of the Qurʾan as a text, and a series of embodied as well as hermeneutical practices, as a model for theorizing literary writing and reading. It examines how Maghrebi novels of the 1940s—1980s incorporate Qurʾanic scripture and rhetorical stylization, as they engage with central debates in Islamic philosophy. To that end, my book reads these works into the classical tradition of adab—a concept that demarcates the genre of belles lettres, as well as the ethical dimensions of personal and social conduct. The Literary Qurʾan pairs Arabophone and Francophone fiction, while bringing more canonical works into conversation with lesser-known ones. This comparative framework disrupts the geopolitical, philological, and ideological divisions that silo Arabic and Francophone Studies. Mobilizing the Qurʾan as a critical lens for studying modern literature, further disrupts authoritative narratives about the meetings between East and West, and Islam and Post-Enlightenment secular Europe.